Prior to the European settlement of the Kingston region in the 1650's, the Red Hook area was inhabited by the Esopus and Sepasco Indians. It is said that early Dutch navigators charting the River came upon Cruger's Island (actually a peninsula or "hoek") when it was turning red with sumac and Virginia creeper in early autumn: hence the name "Red Hoek"
Sometime before 1688 Colonel Pieter Schuyler, first Mayor of Albany, acquired from the Indians most of what we know as the Town of Red Hook, and in that year the Colonial Governor confirmed "Schuyler's Patent" and his ownership of the land. By 1752 Schuyler's tract was owned jointly by four landlords, most notably Colonel Henry Beekman, Jr. and Palantine German families, moving down from Germantown, had started to take leaseholds and develop an agricultural economy. At the time of the Revolution there was a small settlement at Upper Red Hook, docks at Tivoli, at Barrytown and at Cruger's Island, and saw mills on the Saw Kill at Annandale, at Red Hook Mills, at Rock City and on the White Clay Kill near Tivoli. Some of these mills were burned by the British in 1777. The Albany Post Road, which ran from New York City to Albany, was the only road of significance; supplementing it were roads to the mills and the River landings. Thomas' Tavern in Upper Red Hook and Elmendorph's Inn in "lower" Red Hook (both are still standing, the latter restored as a local landmark), were important meeting places, and the "Old Red Church" in Tivoli was the only house of worship. Until the early 19th Century most of the land in the Town was still owned by heirs and assigns of the early patent holders, and was leased for long terms to farming families. The area's first important public official emerged at about this time. He was Judge Egbert Benson of Upper Red Hook, who served as New York's first Attorney General and as a Representative to the Continental and U.S. Congresses. When the Rhinebeck Precinct of Dutchess County was established in 1737 for the purpose of defining political jurisdiction, Red Hook was included. Red Hook became a separate Township on June 2, 1812. Until the end of the 18th Century, the neighborhood of the present Village of Red Hook was known as "Hardscrabble". This was merely a crossroads boasting little more than the inn and a couple of houses. When the postmaster in "Upper" Red Hook, General David Van Ness, moved to the Lower Village in the 1790's and built the brick mansion known today as Maizeland, he brought with him the post office name, and the Lower Village has been called Red Hook ever since. Maizeland is still standing, a cherished architectural and historical landmark. During the 19th Century the Village grew rapidly in population and commercial activity. The First National Bank was founded in 1865, and for many years tobacco and chocolate factories, a hotel, a village newspaper and other enterprises flourished. Lower Red Hook Landing became Barrytown in the 1830's, named for a U.S. Postmaster General; and Annandale (formerly Cedar Hill) derived its name from that of an adjoining estate. Upper Red Hook became Tivoli in the 1790's, taking its name from a neighboring mansion in recollection of the Tivoli gardens in Rome. Initially the name Tivoli was applied only to the hamlet which clustered around the landing; the community on the heights was known variously as Myersville, Mechanicville and Madalin. In 1872, however, both hamlets together were incorporated as the Village of Tivoli. A major industry in Tivoli during much of the 19th Century was a wool mill. At both Barrytown and Tivoli the harvesting of ice from the frozen Hudson, for local storage followed by shipment and summer sale in New York City, provided seasonal employment for many. Generally, however, subsistence farming, dairying and fruit growing have for 150 years been the basis of the Town's economy. Recent years have seen a decline in dairying and an increase in the raising of specialty crops or animals, roadside stands and pick-your-own operations. Until the mid-19th Century the principal modes of transportation for both goods and people were the horse and River sloop or steamboat. Although regularly scheduled passenger and freight boats continued to stop at Barrytown and Tivoli until the 1930's, and the Tivoli/Saugerties ferry plied the River until the 1940's, the fate of River commerce was sealed with the opening of the Hudson River Railroad (now CSX/AMTRAK) in 1851. Throughout the succeeding century Barrytown and Tivoli were busy rail depots as well as steamboat landings. In the late 1930's Route 9-G was constructed through the Town, and in 1957 the Kingston-Rhinecliff Bridge was opened; these have fostered Red Hook's role as a "bedroom community" for major regional employers such as I.B.M. The scattered one and two district schoolhouses of the 19th Century were consolidated in 1939 in the Linden Avenue School. Subsequently the Mill Road School and new High School have been built. In 1860 St. Stephen's Episcopal Seminary was established at Annandale by John Bard. Renamed Bard College in this century, it is a major presence in the cultural life of the Town. One of the Town's best known attributes is the series of "River places" which extends the length of the Town's western edge. These twelve country seats had their origins in the families of the early patentees, chiefly the Livingston/Beekman clan. Surprisingly, most of these mansions and estate/farms have survived, and among the more important are: The Pynes (ca. 1790); and Edgewater (1820). That portion of the Town lying west of Route 9-G and all of the Village of Tivoli are within the Hudson River National Historic Landmark District, established by the Secretary of the Interior in 1990. 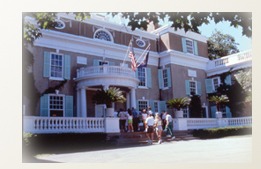 In 1988 Montgomery Place, built by Janet Livingston Montgomery, was opened as a museum property. Clermont, the Livingston family seat, is a New York State Historic Site just across the Columbia County line. For many years the Old Rhinebeck Aerodrome (actually Red Hook) has been a popular attraction. Newer additions to the recreational attractions of the Town are Poet's Walk Park with its outstanding Hudson River views, the scenic Tivoli Bays National Estuarine Research Reserve and the Town's Recreation Park. All of these added to the Town's well-known pick-your-own farms, and the many fine restaurants, antique and specialty shops in the 19th century Villages of Red Hook and Tivoli make the Town an increasingly active participant in the Hudson Valley's heritage tourism economy.